Because of his love and reverence for the sport of Boxing, the author has spent over 15 years amassing and defining words and phrases related to the “Sweet Science” and incorporating them into book form. The Boxing Dictionary is a book with nearly 2000 entries revealing a hidden, almost secretive, language known by only a few in the “hurting business,” a.k.a. the sport of Boxing. This book is just like any other dictionary you’ll find, but again, very specific to the game of Boxing. First in the making, it defines “the language of the ring” as never done before, word by word, phrase by phrase. It showcases a colorful and descriptive language replete with instruction, advice and praise but also includes an abundance of insults, sarcasm and criticism. Boxing is a sport that draws from us, from our primitive souls, the most interesting, creative, but also bizarre remarks than any other sport in existence today. After all, who among us can sit and watch a championship–or any bout–without reacting to it in some way? This is the language the author has captured and revealed to you, the reader. over 15 years in the making. Boxing is a culture dominated by certain behaviors, beliefs and a variety of both learned and instinctive skills. Yet, the most important variable to this sport is its language. Think of a fighter who can talk the talk, and back up what he’s saying with an impressive win over his opponent. After all, it starts before the two combatants step into the squared circle, where they trade barbs by ‘trash talking,’ or ‘talking smack’ about each other in an attempt to psych-out or throw their opponent off his game plan. Contrary to common belief, all this hype has much to do with the final result that ultimately ends in victory or defeat. Fighting words come from confidence a fighter has gained by being in the ring with countless opponents. Fight talk is an intricate part of the fighting action of the “ hurting business” a.k.a. the sport of boxing; a sport where the object is to win at almost any cost. The “fighting language” adds dimension, color and feeling to an already tantalizing sport. like you’re in there with the fighters themselves. Order The Boxing Dictionary today! Applicable sales tax to all Vermont residents. 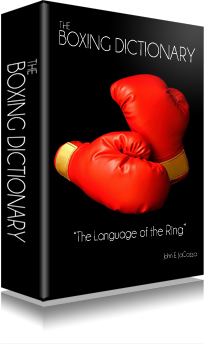 © 2012 The Official Site of 'The Boxing Dictionary' | Another great book published by The Cow Pie Press .